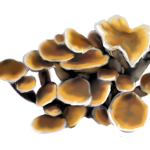 Chaga contains a wide variety of active triterpenes; of these, inotodiol is the most active against cancer cells. Inotodiol also has activity against influenzas. 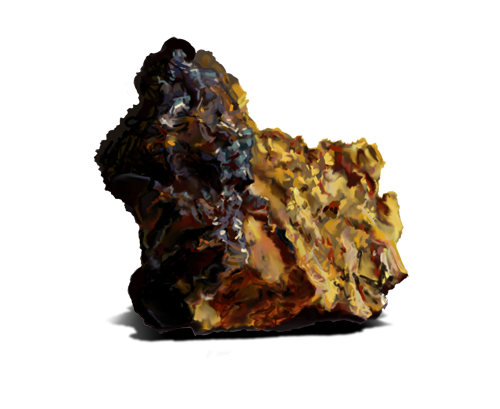 Like a number of other medicinal fungi, chaga also contains active polysaccharides that elict an imune response in the body; such a response is useful in treating certain cancers and infectious diseases. Chaga typically grows on birch trees. It is parasitic and appears as a conk on the outside of the tree. Chaga conks amass the betulin produced in birch trees. Betulin has shown promise in treating a number of disorders. 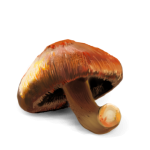 This conk is not technically a mushroom, but an irregular mass of mycelium. Chaga has been translocated from tree to tree by grafting a freshly cut conk to a scar on the new tree. Such a translocation sometimes displaces other parasitic fungi present in the tree.